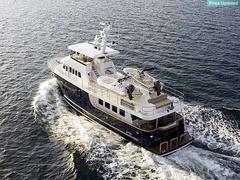 A note arrives from Stefanie Smith at Northrop and Johnson to say that Chuck MacMahon is now the central agent for sale of the 24.48m motor yacht Julianne and that this megayacht has also had a price reduction. Delivered by Northern Marine in 2006, Julianne has an interior by Ardeo Design and Scott Cole and sleeps up to seven guests in a master, double and twin plus a Pullman berth. With a cruising speed of 10 knots, she is now asking $4.685 million.